Friday Evening, June 15, 7-9pm: Understanding, then progressively realizing emptiness- bodhicitta is the heart of Dharma. Lama Mark will give progressively deepening explanations and meditations on the nature of emptiness (Skt. śūnyatā). 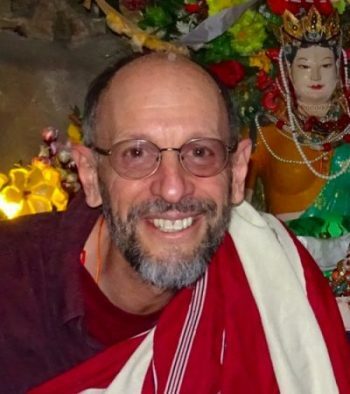 His classes are like a live penetrative vipaśyanā session; he points out directly where to direct our awareness with deepening meditative contemplations on the extraordinary nature of emptiness and bodhicitta. A short text to help our understanding, written by Lama Mark called “Approaching Emptiness” will be available. This class will be important for understanding the reading transmission and commentary on Khunu Lama’s 356 verses in praise of Bodhicitta. Saturday morning, June 16, 9:30am—11.30am & Saturday afternoon, June 16, 2:30 — 4:30 pm: Reading transmission and explanations of Khunu Lama Gyaltsen’s 356 verses in praise of Bodhicitta called, The Jewel Lamp*. Bodhicitta is infinitely vast and astounding in its manifestations, yet has a singular nature of the complete wisdom mind. This text, which has outer, inner, hidden and suchness descriptions of bodhicitta—natural and infinitely expansive qualities—are superb and rarely encountered. Sunday Morning June 17, 9.30-11.30am & Sunday June 17, 2.30- 4.30pm.Continued read- ing transmission and explanations of Khunu Lama Gyaltsen’s, The Jewel Lamp. * Available as: Vast as The Heavens and Deep as the Sea, verses in praise of bodhicitta. Khunu Rinpoche, Wisdom. Boston. We suggest participants to purchase this book for attending the sessions and future meditation.